It used to be that the most technologically complex present Santa left under the tree on Christmas Eve was a video game console or something radio-controlled. In recent years, however, the elves in his workshop have been brushing up on some pretty advanced tech that's finding its way into modern toys. These days, kids are playing with everything from virtual reality immersion and brain wave-reading neural sensors to 3D-printable objects and app-controlled smart drones. Here's a guide to the best in entertaining and educational toys packing the latest in cutting-edge technology. Thankfully for parents, most of it is assembly-free. * What it does: While wearing a Bluetooth headset equipped with neural-sensing technology similar to what's in an electroencephalogram machine, kids can use the power of the Force (i.e., their brain waves) to manipulate holograms depicting characters and scenes from the Star Wars films. After downloading a free app onto an iPad Air or Samsung Galaxy Tab, users progress through 10 levels of Jedi challenges such as moving a training remote and knocking over battle droids to lifting a Starfighter from a murky swamp. The headset reads kids' brainwaves and reacts based on their level of concentration. These scenes are rendered on the tablet but appear 3-D when viewed as reflections off screens attached to the Trainer's viewing base. Additional future content is planned for release following the Friday premiere of "Star Wars: Episode VII - The Force Awakens." * Price: $120. Available online from $80. Requires a tablet to function. * What it does: A nominee as this year's Innovative Toy of the Year by the Toy Industry Association and one of Time magazine's 25 Best Inventions of 2014, Osmo is a gaming/educational tablet accessory that blends kids' love of tablets with old-fashioned physical play. Placing an iPad — currently the only compatible tablet — into Osmo's base stand and attaching a mirror to the device's front-facing camera creates a "playing field" on the table in front of the screen. Osmo can "see" placed within this area, and it's smart enough to interpret these as inputs in a variety of educational gaming apps. Kids can use physical tiles to spell out objects onscreen in "Words," use numbered tiles to add and pop onscreen bubbles in "Numbers," arrange puzzle pieces to recreate an onscreen pattern in "Tangram" or draw objects on paper to direct the path of a falling onscreen ball in "Newton." Future add-on gaming apps are planned. * Price: $100 Genius Kit includes bass/reflector, three games ("Words," "Tangram" and "Numbers"). $80 Starter Kit includes base/reflector and two games ("Words" and "Tangram). Requires iPad 2 or later to work. * What it does: LittleBits is a line of electronic building blocks that snap together using magnets and allow budding tinkerers to create a near-limitless range of devices without the need to learn a programming language or wield a soldering gun. Each LittleBit — there are more than 70 so far — serves a single function (light, sound, sensors, buttons, motors, switches). When combined, these modules can be used to assemble everything from wirelessly controlled vehicles and interactive toys to synthesizers and remote controls. LittleBits are open-source and the company emphasizes the communal aspect of play/invention by encouraging its users to share their LittleBits creations online, create new modules or suggest ones they'd like to see in the future. The company offers several module packages, including general building collections as well as specialized kits for astronomical, coding, home automation and electronic music projects. * Price: An entry-level base kit with 10 modules is $100. Specialized kits range from $90 to $250. Modules from different kits are compatible. * What it does: Controllable using a free app on a Bluetooth-paired smartphone or tablet, Ollie is a 21st-century update to the remote-controlled gadgets of old. Shaped like an enclosed tube, its water-resistant, shock-proof polycarbonate shell and grippy treads allow it safely to leap down stairs, careen into walls and sprint down dirt paths at speeds up to 14 miles per hour. Or users can remove the tires entirely, allowing Ollie to drift around like a street racer. When the paired phone/remote control is held horizontally, users are presented with a trick pad that allows them to make Ollie perform various stunts such as spinning or hopping. Ollie's internal sensors keep track of statistics such as air time, distance traveled and trick combos. Its software also can be used to adjust speed, acceleration and handling for different driving environments. * Price: $100. Add-on accessories include tires ($15) and stunt ramps ($50). Requires a smartphone or tablet to function. * What it does: With a host of mainstream virtual- and augmented-reality devices on the horizon, toymaker Mattel is letting kids sample the technology early by putting a 3-D, interactive spin on its 75-year-old View-Master line of image viewers. View-Master photo reels were one of the pioneering uses of stereoscopic still images, but the virtual reality kit offers kids a chance to completely immerse themselves in 360-degree, animated panoramas that move and react to where the user is looking. The View-Master Virtual Reality Starter Pack includes a plastic viewer, into which kids slip a smartphone, aligning the screen, so the image is divided between the left and right eyes. After loading a free app that corresponds to various add-on experience packs, users look through the goggles at physical photo "reels" and select a scene to explore that appears to float above the disc. Once the scene loads, kids are immersed on digital field trips to the solar system, international landmarks, wilderness biomes and more. While viewing a location, kids also can learn more about what they're seeing by pulling a lever on the goggles to view additional information or videos in dialog boxes that appear to float in front of them. * Price: $30 starter pack includes viewer and a preview reel. Available online from $25. Additional experience packs are $15. Requires a smartphone to function. * What it does: Kids get a chance to experience a taste of 3-D printing technology and exercise their creative muscles to turn liquid gel into physical objects. Kids can either trace out a design with the gel using the included pre-shaped molds and stencils or they can draw their own shapes. After baking for about a minute in a chamber equipped with ultraviolet light, the gel hardens, leaving behind a flexible, plastic object. Multiple objects can be attached together using more gel to create complex projects such as houses, vehicles, jewelry or whatever else the child-creator can imagine. 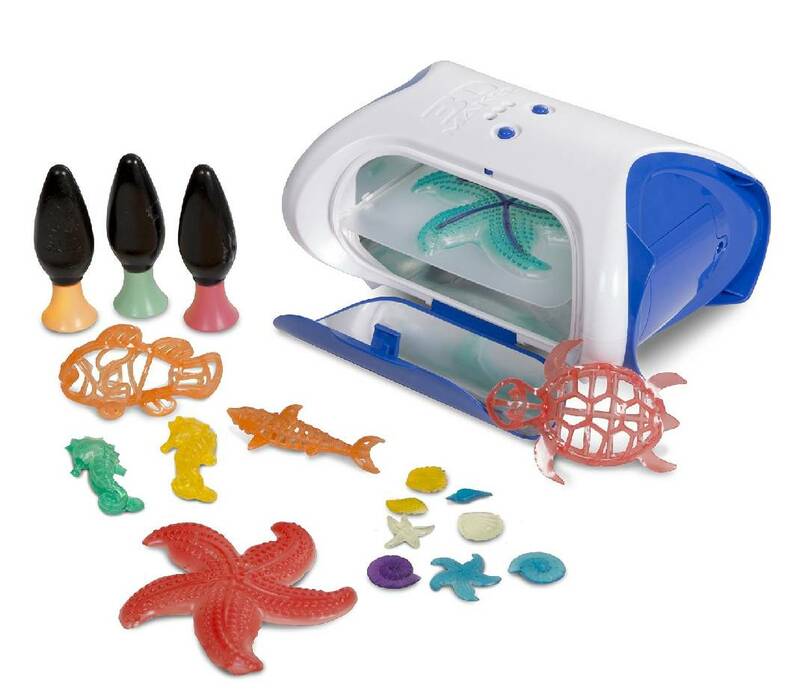 * Price: $40 starter pack includes UV chamber, three colors of gel, four molds, three stencils and two blank creation sheets. $20 add-on activity kits — Butterflies, Dinosaurs, Army, Princess and Building — offer additional stencil designs and gel refills.